Welcome to our latest cash giveaway and oh what fun it this one will be! As always we’re giving you our readers choices, some are tasty choices, one takes you shopping and the other well you can do whatever you want with it. So who is ready to find out more? Powered by Mom and three of her fabulous blogger friends are sponsoring this prize just so one of our readers can have a little extra spending money. 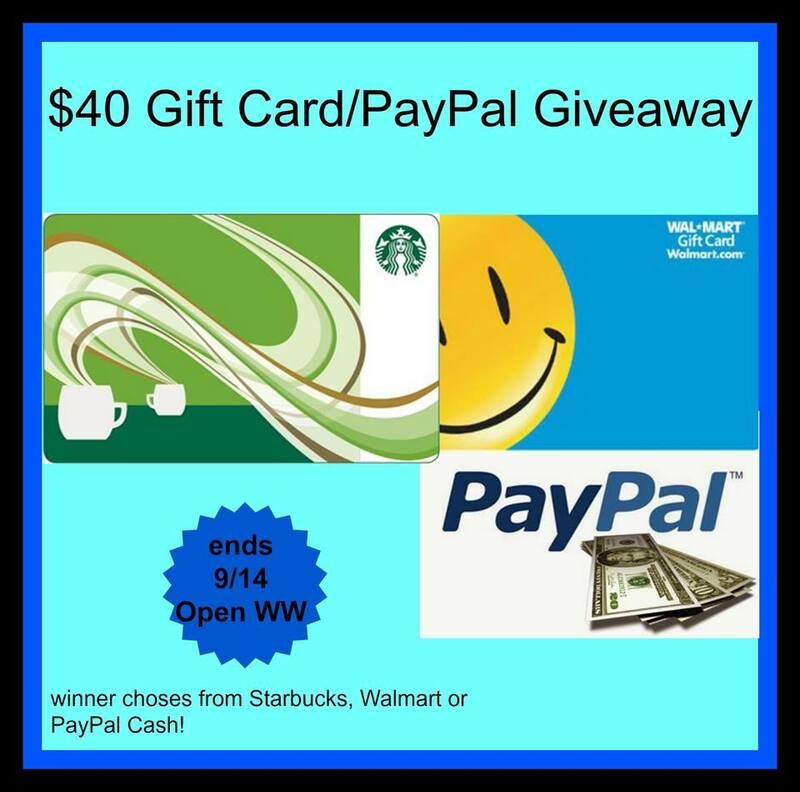 The winner will have the choice of Starbucks or Walmart Gift Card* or Paypal Cash. Winners outside of the US will get Paypal cash. Now don’t forget we’ve got lots of other fabulous giveaways happening. Just check on the right hand side of our page and you will see them all. From a fabulous Ninja Blender System valued at $199 to a $250 Gift Card giveaway. You don’t want to miss out on any of them. Now it’s time to go and enter and don’t forget to come back for the daily entries. Good luck! I would choose Walmart. I would buy storage containers for my pantry. I would choose the Walmart gift card. I would go with the Walmart gift card because there is a set of Curtains I would love to have for my bedroom. Plus I need another can of paint to finish my interior painting I started. would pick paypal it’s easy to use for different things that way. I want the Wal-Mart card, I will get diapers for my new granddaughter. I would choose Paypal since I’m saving to buy a laptop that I’ve never owned. Thanks. I would choose paypal cash. Thanks! I’d choose Walmart because I shop there frequently. I would choose the walmart gift card so I can start Christmas shopping! I would choose the Walmart card. Any/all the choices are great. I would choose the paypal. I definitely would love a Walmart, I could use this to buy dishes with. I would definitely choose Paypal. Mostly because it’s the most convenient prize (for me). I would add it to my bank account and eventually, it’d go towards a phone purchase. I would choose Paypal if I won. My account is about depleted so it would be real nice to have. Walmart gift card would be my choice. I would buy some new shoes for my grandson and some toiletries for the family. I would choose the Walmart gift card and use it for gifts or groceries! I would take the PayPal cash. One income, 5 kids. We need the extra $$. Thanks for the opportunity! I would choose the Paypal. I would use it to take my Mom out for her birthday breakfast! Starbucks. My favorite treat is now being made, and I don’t usually go there unless I have a gift card to spend. Love those pumpkin lattes! I would pick the Walmart gift card. I would choose to win the Starbucks gift card. It would go a long way into helping me with my daily coffee runs! I would take the paypal to help with birthdays .. If I had to choose I would pick out the PayPal account gift card to be able to buy really awesome etsy gifts for me and friends to enjoy. I would choose Starbucks, you can’t get enough Java! I would choose paypal and I would put it towards bills. I would choose PayPal and I would use it towards Christmas! I wiould choose Paypal and I would use it on my ebay and netflx fees. I’ll take the Paypal because I’m saving up for the holidays. As a Canadian, I would choose PayPal and I would use it towards Christmas! Thanks for the chance. It’s Pumpkin Spice Latte season (and Gingerbread latte season is right around the corner! ), so I’d pick Starbucks so I could indulge without the guilt of how much they cost! I would choose paypal. It would go towards a new laptop for my hubby. I would choose paypal. I’m currently looking to move so extra cash would be aweosme. Thanks for the chance! I would choose a Walmart card and buy groceries. Ill pick Paypal and ill save it for a Kitchen Aid Mixer. I’d choose pay pal and I’d save it for a rainy day. I would choose Walmart and use it toward groceries. I think I’m in Walmart at least twice a week! I WOULD CHOOSE WALMART.. THERE ARE SO MANY ITEMS THEY HAVE AT A GREAT PRICE.. THANK YOU FOR THIS OPPORTUNITY…. I would choose the Walmart gift card, because it would be the most useful for me. I would use it to purchase everyday household items. Walmart. we get a little of everything there including groceries. I would choose paypal. Every little bit extra goes toward student loans. I would choose PayPal and use that to buy some groceries. I’d choose paypal and use the cash to pay for some online purchases of random stuff. I love random stuff. I would choose paypal and put it towards my husbands birthday! I hitnk I would go with the Walmart at this point and I’d use it to buy every day essentials. I’d go with PayPal as we don’t have a Walmart nearby. I have ordered from them through mail, but not as big choice, and have to spend more than $50 for free s&h. PayPal, larger selection of shopping sources. 🙂 Thanks for the chance. I would choose paypal! That way I can spend it anywhere, and I would spend it on christmas gifts! I would choose paypal since I have my kiddo’s bday coming up. I would choose Paypal since I’m saving to buy me a laptop. If I won, I would choose Walmart and save it for Christmas gifts for my kids! The holidays will be here before you know it! Thank you! PayPal to go towards Christmas gifts for my kids. I would choose the Walmart gift card. I would use it to buy a large bag of Iams dog food! Hope I win. Thanks for the opportunity to win.